In January, 2008 I put together the WKUSB CW keyer kit. This was a Christmas present from my father-in-law and was something I had been looking forward to completing. This is my third morse code keyer kit from K1EL - having previously completed the K20 and the WinKey (aka Winkey1). It comes with a great enclosure. Enclosures have always been a weak link in my previous kits. Some guys have a knack for making a kit with a great looking enclosure. Not me. My previous kits have been quite ugly. USB interface to the PC. My ham shack has transitioned in the past few years from a desktop PC to a decent laptop. The problem with laptops lately though is a lack of serial ports (RS232). Rather than go through a USB to RS232 converter and add more complexity, this kit offers a direct USB connection to the PC. More bells and whistles added to the next generation of K1EL keyers. Steve seems to always throw in a few extra features with each revision... even if I won't use them all, it's good to know they are there :). You'll want to take an inventory of the parts once you open the box. The K1EL team packs things neatly. Click on the image to the left and you'll see that everything was well organized and sealed tightly to keep it fresh. Every part was accounted for in my WKUSB - so I was ready to move onto the next step... soldering the keyer. Soldering components to the WKUSB is not too difficult and experienced kit builders will breeze through the instructions in less than an hour. Even beginners should be able to tackle this once they've mastered some basic soldering skills. In my case, I took about two hours (with interruptions). By the way, if you are looking for an extra challenge, try building the keyer with your 5 year old daughter asking questions the whole time. Once you've added the components to the board, you'll want to test it with the PC and provided software. The test worked great for me - which meant no solder bridges or other mistakes. Once the testing is completed, you are ready to install the board in the enclosure. This can be a little tricky as it is a tight fit. Follow the instructions and be patient and you'll get it. The WKUSB enclosure was a big selling point for me. I've constructed several kits in the past that have worked fine but looked awful. It was nice to know the enclosure would ensure a good looking final product. The WKUSB enclosure has a clean fit and finish, easy to access buttons and connectors and just plain looks good. 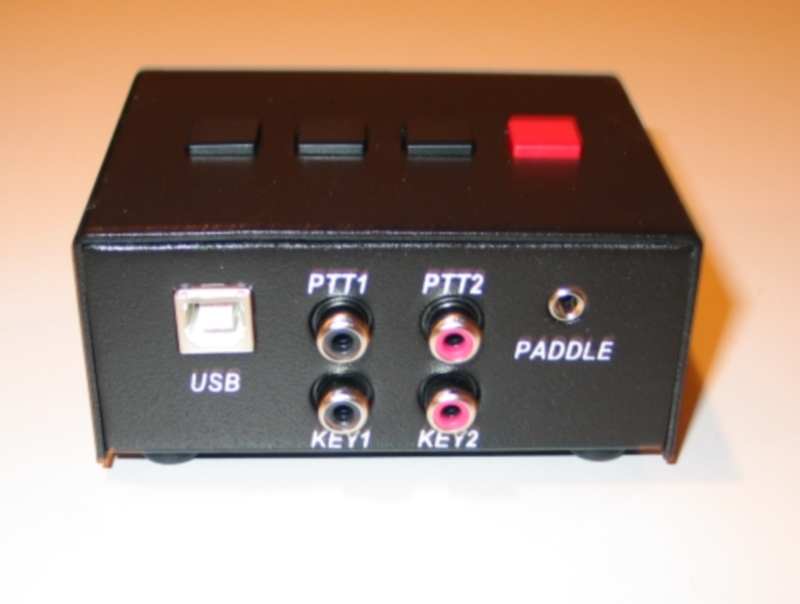 The back panel of the keyer enclosure offers the USB connection, keyer (rig) connectors and a paddle input. To connect the keyer to my Icom, I ordered a cable with a male RCA connector on one end and a male TS on the other. The K1EL site recommended this cable from sweetwater.com ($3.29 with a 5' cable including free shipping). This was a fun kit to build and the WKUSB seems to meet my needs. Look for a full review of this keyer on the ham radio product reviews pages. What is Ham Radio? An introduction to the hobby known as ham radio. Ham Radio Exams. Practice taking the U.S. FCC amateur radio exams on-line. PDA Tips for Ham Radio. Some creative ideas on how ham radio operators use PDAs.